Are you drawn to rustic-chic? Why not have a rustic-chic wedding theme? Northern California provides the perfect backdrop for all your ideas. A rustic-chic wedding theme is a trend that is on many bride-to-be's radar. It is a classy, down to earth style with so many possibilities! From the charm of a barn to the chic old world feel of a vineyard, the rustic-chic wedding theme can be created in your unique style. Here are 7 fresh ideas on a rustic chic theme to give your wedding the personal and unique touch it deserves. Rustic Chic Idea #1: Start by choosing a color scheme. Rustic chic wedding themes often incorporate bright colors and neutral, earthy tones. From your leather to lace and wood to rusty metal, your earthy tones are covered. Choosing a bright color to accent will make a bold statement. Turquoise, salmon or yellow are popular choices. A rule of thumb is to think about bright gem colors. These will all work well with earthy colors. For a more romantic look, you can choose cream as your main color and accent with the earthy tones. Black ink calligraphy on faded chalkboards painted in your theme color with big silk creamy bows makes a beautiful combination for a romantic but rustic chic feel. Rustic Chic Idea #2: If you’ve been reading this blog long, you will know that we are in love with paper. Invitations can be customized to match your rustic chic theme. The invitation is your guest’s first look at the theme of your wedding. Consider mirroring your dress and use lace to add to the chic look, but adding a hint of a floral pattern or a jute bow for the rustic touch. Rustic Chic Idea #3: Your cake should to be the centerpiece of your reception. Consider rustic cake stands. Old wooden crates, painted and distressed make a beautiful table decoration that can also double as stands. Distressed and even simulated rust, decorative tin cake stands stacked in a tiered formation can be a great way to showcase your cake. Rustic Chic Idea #4: Photo booths or selfie stands are popular in modern weddings. You want people to be able to showcase all your hard work. Small, rustic chic themed weddings often use small barns created just for taking pictures. Don’t want to recreate a small barn? You can make rustic-chic walls with barn wood, weathered brick, beautiful stonework, or even rusty, corrugated iron instead. Consider adding distressed farm tools and wild flowers to these areas. Rustic Chic Idea #5: Rustic-chic themed weddings feature wild flowers in a big way. Native and wild flowers make beautiful and classy statements. Incorporate these flowers into the centerpieces, bride’s bouquet, and bridesmaid’s flowers as well. Rustic Chic Idea #6: Calligraphy is definitely a big feature in rustic chic themes. The combination of elegant lettering on rustic surfaces really gives this look its character. Be creative with the surfaces: wood, old mirrors, glass window panels, or strips of silk. Rustic Chic Idea #7: The last thing your guests leave your wedding with is the favor. A cute idea is to give them a message about you as a couple or about love. Use distressed small child sized cowboy boots. 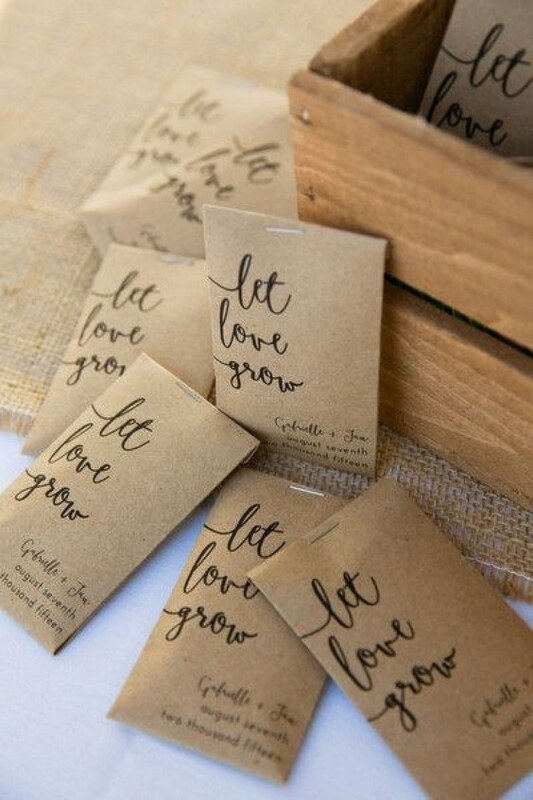 In each boot, have a small pack of dirt and a wildflower seed packet customized with a saying like “Let Love Grow”. Your rustic-chic wedding theme should all about texture. I can help you put all the details of your wedding together to bring your vision to life. Click here to schedule a consultation with me.